When marketing your game, it's not always enough for your game to simply be put in front of players; often a review by someone that a player trusts can make all the difference in understanding why a game is interesting and why that player should care. Players also have a lot of choices today in the games they can spend their time playing. Again, the voice of someone they trust can make all the difference in discovering the interesting and exciting games to play next. These are the goals of Steam Curators–giving a way for trusted voices to help players explore Steam and discover interesting new games to play. A Steam Curator is an individual or group of people who are interested in improving the shopping experience for others by highlighting games from within the Steam catalog. Curators can choose to write positive reviews for games they recommend to their followers, or can write negative reviews for games they think are a bad fit for their followers. Curators can also simply post informational reviews, often providing some additional information on the game that their followers find helpful. Some Curators started out as well-known individuals or press organizations that have established communities. Some have started entirely through Steam Curators and have built up an audience by serving a particular genre or niche audience really well. Curator Connect is designed to make it easy for you to send review copies to the Steam Curators with the right voice, personality, and audience for your game. Within Curator Connect, you will find the tools to search and filter the list of Curators to find the best fit for your game. Then you can craft a personalized message and send a review copy of your game directly and immediately through Steam. No need to mess with e-mails or keys. Curators see a preview of your game, along with the first 3 screenshots on your store page and the message you include. 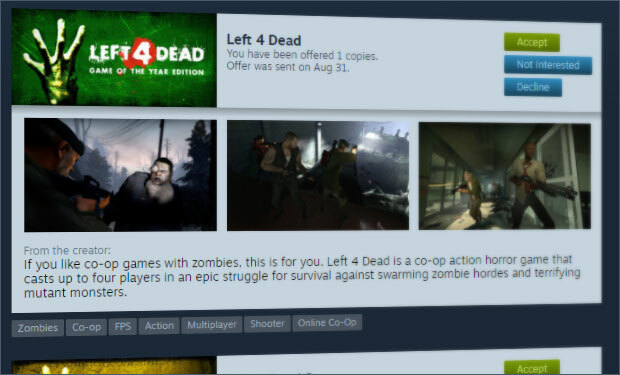 Curator Connect allows a game developer to send a copy of their game directly to Steam Curators that the developer chooses. This process happens entirely within Steam where you can search and filter the available Curators to determine which Curators are most likely to have an audience that is interested in your particular game. Many Curators are comprised of a few individual reviewers, so we’ve made it possible to send multiple copies of your game to a single Curator. This is also helpful if you have a multiplayer game and you want to make sure that the team members of a Curator can play the game together and properly evaluate. You can filter by the tags a Curator says they focus on, such as "Simulation" or "RPG" or "Sandbox". You can also filter by language or operating system, or select Curators that just review VR games. For each Curator, you can see how many people follow that Curator on Steam and how many followers or subscribers they may have on other platforms such as YouTube, Twitter, Facebook, or Twitch. This can help you identify which Curators have a sizable following, and whether that following is relevant for your game. But don’t evaluate Curators by audience size alone. A Curator with fewer followers and highly tailored recommendations might be just as valuable to your game as a Curator with many more followers but broader recommendations. By default, it tries to show Curators that have specified particular tags that they Curate, and have the strongest overlap with the tags associated with the game that you are considering sending. It will weight higher the Curators with higher follower counts and with more specific overlap in tags with your game. Some Curators cater to audiences in different languages, so we’ve included ways to translate what the Curator says about themselves so you can help understand if they are right for your game. To get started, you'll need to have a game that is either already released or at least has a publicly-visible store page. To access Curator Connect, first select your app from within Steamworks. On your app landing page, you'll find a menu item for "Curator Connect" under the marketing section. Clicking the "Curator Connect" link will walk you through the process of enabling Curator Connect for your game and then searching for Curators to send copies to. Users must have "Generate CD Keys" permission within Steamworks in order to access the Curator Connect feature. Selecting Curators - You can use the controls to filter the list of Steam Curators to pick from. You'll want to identify Curators that have an audience that is likely to be interested in your particular game. Crafting your message - You'll also need to include a message to the Curators. This should be brief. Along with the message, we automatically include information about your game such as name, logo, screenshots, and primary tags. In your message, you want to get to the point and tell the Curator why their audience will care and what is special about your game. If you wish for the Curator to contact you for more information, please include your contact information as well. Included content - By default, the package that is sent to Curators is created with the same contents as the base store package for your game. If you add new depots (such as new operating systems), you'll want to make sure you add those to your Curator package as well. You can also add more content to this package if you wish to also send DLC or soundtracks or other additional depots to Curators. Q. Does my game have to be released in order to use Curator Connect? A. Your game needs to have at least a 'coming soon' page publicly visible before you can send copies of your game to Steam Curators. Once your store page has been reviewed, approved, and you've set it live, you may use Curator Connect for that game. Note that you need to have a build of your game uploaded so that Curators can play it when they receive it. Q. How many copies can I send? A. You can send offers to 100 Curators, with a maximum of 5 copies of your game each. Sending more than one copy to a Curator is primarily useful for cases where you have a multiplayer game that individual reviewers within a Curator need to be able to play together. Q. What happens when I send a copy of my game? A. When you send a copy of your game to a specific Curator, the game will appear in a dashboard to members of that Curator with permission to accept games via Curator Connect. Each member with the necessary permission will also receive an e-mail notification alerting them to new games pending via Curator Connect. Each member can then select to accept the game on their account or to ignore the game. You as the developer have a dashboard to see the copies you've sent to each Curator and how many have been accepted. Q. Can I revoke a game from a Steam Curator? A. You cannot revoke a game from a Steam Curator once they have accepted it. But if you have sent a copy that has not been accepted, you can expire that offer so the game will no longer be available for them to accept. Q. Can I send a pre-release copy of my game? A. Yes. The game you send to a curator will be immediately playable, regardless of whether it is available for sale yet. You can use this to send preview copies to Steam Curators to get word out about your game prior to your launch. Of course, you'll want to make sure your game is in an enjoyable state before sending it out. Q. How do I know which Curators are effective? A. The right Curator for your game will depend on the kind of game you have. You can search for curators by tag, language, OS, or name. For each Curator, you will see a brief description of the kinds of games they focus on. You can then see how many followers they have on Steam as well as followers on YouTube, Twitter, Facebook, and Twitch. You can also click on each Curator to visit their store page and see some of the other games the Curator has reviewed. This should give you an idea of whether any given Curator is a good fit for your game. Q. Are Curators obligated to write a review for my game? A. There is no obligation on the part of Steam Curators to accept, play, or review your game. A Curator may accept and play your game and discover that it is not right for their audience. Or a Curator may outright reject a game if it is clearly not relevant for their audience. Q. How do I access Curator Connect? A. You must have "Generate CD Keys" permission within Steamworks in order to access the Curator Connect feature. If you have that permission, you will see a link under the "Marketing" section on your app landing page in Steamworks. Q. Why can’t I find Curator “_____” in Curator Connect? A. We limit the Curator Connect list to those profiles that continue to be active in the Steam Community. If you are unable to find a specific profile in the Connect tool, it is likely that they have not reviewed a title or been active in the Community in the last 6 months.